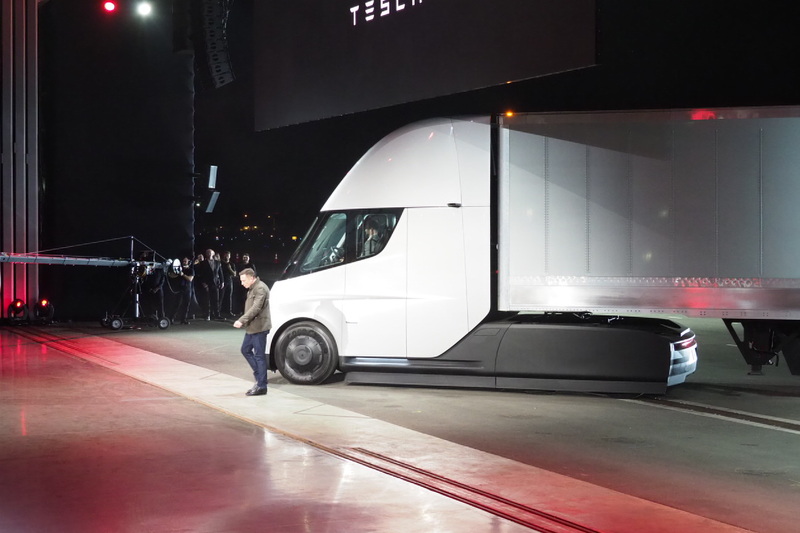 Tesla has unveiled its all-electric semi truck, aptly dubbed the ‘Tesla Semi,’ as promised, and the resulting Class 8 transport vehicle is indeed a sight to behold. It boasts a considerable charge capacity, and has a very aesthetically distinct look, as you can see, which will obviously help it stand out from other commercial freight vehicles on the road. The Tesla Semi will go 0 to 60 mph in just 5 seconds, which is incredibly fast compared to a diesel truck. It can go 0 to 60 mph towing 80,000 lbs, its max tow load, in just 20 seconds. It can go 65 mph up a 5 percent grade, which is way better than the 45 mph max that a diesel competitor can do. And for range, it can go 500 miles at highway speed, and less than 80 percent trips are at 250 miles. It also has a better drag coefficient than a super car thanks to its extremely aerodynamic design. The real secret weapon of the truck, however, isn’t that it can turn into a giant fighting robot (this feature hasn’t been activated yet, if it does exist, and Tesla won’t admit that it does). Instead, it’s that the truck offers a transmission that requires no shifting of gears (as is normal for fully electric vehicles) with regenerative braking that provides “basically infinite” brake life per Tesla. Tesla also says that the Semi outperforms its diesel rivals in terms of responsiveness and handling, and can cover more miles than a diesel semi truck in the same timespan, with safer operation in and around regular traffic. It also uses a number of Model 3 components to maximize production efficiencies, including individual Model 3 motors for each wheel, and even Model 3 inset door handles. Another standout for Tesla’s Semi lies in its design – the company points out that that cabin is tailor-made for drivers, with starts that are designed to make it easier to get in and out, and the ability to stand fully when inside the cab. The driver is also centered in the cab relative to the road, a unique twist on vehicle design in general, but a logical one for a car class that almost never has a passenger. There’s a removable jump seat for a passenger, too, offset and behind the main driver position. Tesla has also added not one, but two of its favorite in-cabin vehicle features to the Semi: Touchscreens. These are positioned on either side of the driver and offer navigation information, blind spot monitoring, and trip data logging applications. There’s also a suite of fleet management and routing tools, which Tesla says would ordinarily require third-party add-on hardware to incorporate into a car. 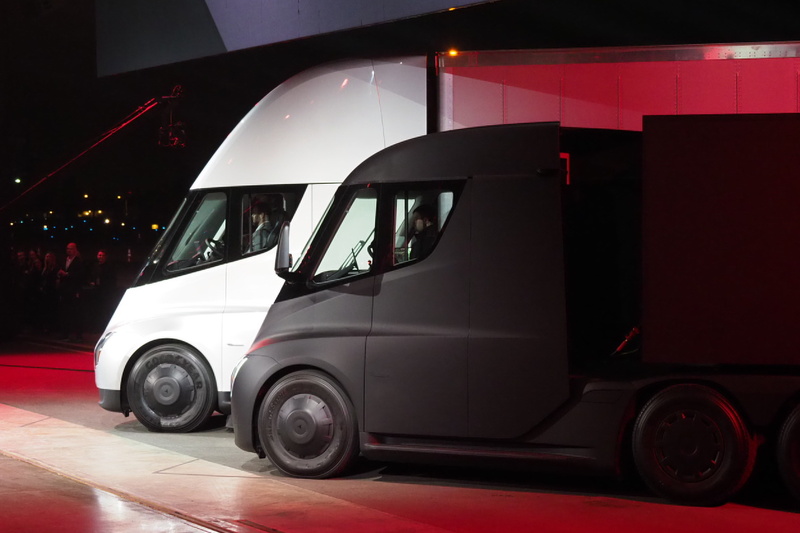 Electric trucks aren’t the exclusive purview of Musk and Tesla, of course. There’s the somewhat trollishly named Nikola, which is working on a hybrid hydrogen powered electric powertrain, which its building with Bosch. Also, Daimler has revealed its own concept for a Mitsubishi E-FUSO fully electric Vision One truck with 220 miles of range, but with no specified release window. What’s the big deal about an electric semi truck? It’s a fair question, especially given the range of traditional Diesel engine heavy-duty trucks. These can have ranges of up to nearly 900 miles on a single tank. But the long-term advantages of electric trucks could make a lot of sense, both from a relatively obvious ecological perspective, which is obvious, and from the perspective of cost-effectiveness. It also charges up at solar-powered Megachargers, and can get 400 miles of range on a single 30 minute charge, which can be done while you’re loading and unloading by detaching the cab. Tesla plans to have these Megachargers placed worldwide to ensure that people can move from one destination to anther easily and charge without issue at both destination and origin. Electric trucks could be longer-lived and less expensive to maintain over the long term, and the cost to refuel them over their lifetimes should be far less than the cost to operate a truck that uses an internal combustion engine. Tesla says the Semi requires “significantly less maintenance” than a diesel truck, in particular because it lacks the high-strain moving parts of internal combustion engine vehicles, including the engine, transmission, after-treatment system and differentials. The Tesla Semi also offers advanced safety features, with a special battery design that reinforces the battery units themselves and also helps lower the center of gravity of the truck overall thanks to their positioning in the chassis. The windshield is also built of glass designed to resist impacts, and the truck is made to avoid jackknifing, a common problem for this class of truck, by automatically detecting any stability that could lead to this issue and torquing each wheel accordingly, whose also activating the brakes as needed. Surround view cameras try to eliminate blind sots, and also help to support object detection, providing alerts to the driver automatically when they identify potential hazards. Tesla has also built Enhanced Autopilot features into its Semi, which is not surprising given the work it’s done pioneering and refining these drier assistance features on its lineup of consumer cars. On the Semi, Tesla’s Autopilot offers automated emergency braking, lane keeping and lane departure warnings to help encourage safe highway driving. This is definitely a futuristic version of the modern transport truck, with a lot of bells and whistles that indeed look like they could make the lives of both freight shipping companies and drivers much more comfortable and convenient overall. The focus on drivers, in particular, is interesting as it appears as though Tesla is hoping to gain support for its trucking from ground-up endorsement, as well as by appealing to the long-term financial reasoning of the shipping companies themselves. This version of the truck is a day truck, without a sleeper and designed for short hauls accordingly. But Tesla said it could easily extend the cab to accommodate a sleeper cabin, and then extend the underlying battery pack to support that, too. It can also be used with or without the aerodynamic cowling above the hood, depending on the height of the trailer it’s pulling. Tesla will probably still face a lot of challenges in terms of both getting this truck built at scale, and encouraging broad adoption. But it’s sticking to its playbook of looking at an industry where the legacy players have done something one way for a long time with relatively little in the way of innovation, and changing things drastically. The question is whether applying this model will continue to work in its favor. With a million mile warranty against any breakdowns on every truck, Tesla is doing its best to convince people that change is a good thing.